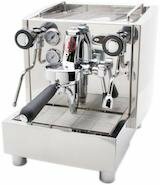 The popularity of the E61 group among home barista's is well established. To date, there are nine (*) other reviews of E61-based espresso machines on this site alone! Although the iconic chrome-plated E61 grouphead is well recognized among the site's reviews, the last one was written over two years ago, so an update of a representative of the E61 dual boiler clan is overdue. Izzo's rendition of the group brings other popular features like electronically controlled brew temperature (often called a "PID"), rotary pump, and the ability to switch between water drawn from an inboard reservoir and directly plumbed. This review will summarize the Duetto's brew temperature consistency, steaming performance, and offer tips on producing the best espresso. The E61 group has a well-earned reputation for being "forgiving" of minor barista errors. Water is evenly diffused over the surface of the puck prior to pressurization; this initial wetting allows the puck to expand and potentially close small fissures. The automated preinfusion also helps reduce channeling by slowing the brew pressure ramp. Many of the E61 espresso machines on the market use a heat exchanger to deliver brew water; the article HX Love explains how the barista flushes water through the group to fine-tune the brew temperature. But the Izzo Alex Duetto, as the surname "Duetto" suggests, has two boilers, one dedicated to steaming, the other to brewing. It still relies on a thermosyphon to keep the grouphead toasty, but the flush routine is simplified compared to an E61/heat exchanger combination. With a setpoint of 200°F, the idle no-flush temperature measures a few degrees cooler. Not surprisingly, this indicates that the group idles below the target brew temperature, as I've measured on other E61 groups. The next measurement 30 seconds later was nearly spot on. With closely spaced intervals of 30 seconds representing back-to-back shots, the temperature ticked up one-half degree. All-and-all, a very good showing for a semi-commercial espresso machine. The Izzo Alex Duetto has a separate switch to disable the steam boiler. This is handy for espresso purists who only occasionally need steam for lattes and cappuccinos. But the lack of preheating incoming water does impact the brew temperature stability slightly under load; closely spaced extractions were less stable, presumably because the electronic temperature controller (PID) would overcompensate and thus overshoot the target temperature. Even so, if your pace is no more than one espresso every 90 seconds, powering off the steam boiler had negligible impact on temperature stability. In a nutshell, for best temperature stability on the Duetto, do a very short flush if it's been idle for more than 3 minutes and allow 30 seconds for the group to re-stabilize before starting the extraction (e.g., flush before dosing/tamping). If it's been idle for more than 6 minutes, do a longer flush instead (e.g., enough to prewarm an espresso cup). It's really that simple to nail the brew temperature within one degree every time. Over the course of numerous tests of espresso machines using the E61 group, there remains an indisputable conclusion: Even water diffusion and gentle preinfusion are the cornerstone of its consistent, barista-friendly design. For this review's group blind taste test, the Izzo Alex Duetto went against an industry benchmark in temperature stability and consistency, the La Marzocco Linea PB. Although the Duetto didn't win the shootout, taste testers agreed it was a close call in what could be called an unfair David and Goliath fight. I agreed with other attendees that the two were very close in flavor profile, though the La Marzocco held an edge on clarity. I described this separation of flavor as two chocolate bars, both containing nuts, but the nuts in one are finely ground and the other coarsely ground. To continue the analogy, the overall flavor profiles of the two chocolates are very similar, but the taste experience of "nuttiness" is noticeably different. Some might describe the more subtlety defined taste of the finely ground nuts in chocolate as "smooth" and the coarsely ground nuts as "sharp". Both espresso were very good, but not identical. The Duetto may not be a speed demon in the steaming department, but it's not a slowpoke either. Steam time for a modestly-sized latte is around 35 seconds, though more than 45 seconds if you prefer "Big Gulp" latte volumes. I brought the Duetto to a cars-n-coffee event at a local dealership, serving more than 60 people over the course of two hours. The backlog did reach 8 drinks at one point, but the Izzo Alex Duetto plugged along consistently, putting out a cappuccino in less than 45 seconds start to finish. Thanks to its dedicated steam boiler, there was only a slight increase of brew temperature under load (i.e., the preheated water from the steam boiler's heat exchanger pushes the brew temperature up one-half to one degree Fahrenheit under heavy load). The modest steam speed and two-hole tight V dispersion pattern will be appreciated by new baristas; it's easy to get the milk to roll in a 12 ounce pitcher without accidentally overflowing the top. The no burn arm is newbie friendly and easy to clean. New home baristas introduced to the Izzo Alex Duetto were successfully trained in less than 15 minutes; after 10 drinks, they produced cappuccinos with creamy texture on par with good local cafes. After a week or two of practice, a home barista is certain to produce microfoam nearly as good as an experienced barista. Tips: Be careful about purging steam condensation into the driptray; it's shallow and will splash if partially full. Pro baristas who are accustom to spinning the steam know closed should be forewarned that the Duetto's knob binds shut if spun hard.